Everyone knows that cats like to sleep. In fact, they spend an average of 16 hours a day sleeping so if anyone needs a good bed, it is our furry feline friends. However finding a bed that they like is easier said than done! As a cat owner myself, I know how particular they can be – they often turn their noses up at the bed you have spent your hard-earned money on, and curl up in the tatty cardboard box it was delivered in. But even the most fussy cat will find it hard to resist one of the fantastic cat beds that we have found online – check them out, and see what you think! This stylish Banana Leaf Sleeping Den is made from natural Banana leaf material, which is woven together by hand. It is robust and scratch-resistant, as well as having a warm and natural look which will look good in any room. 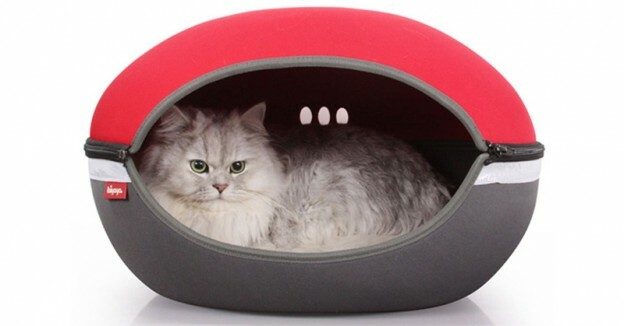 The enclosed sleeping den will give your cat a safe and secure place to sleep and relax, and comes complete with a linen cushion for added comfort. This stylish Jolly Moggy Bamboo Radiator Bed is purr-fect for your cat if they like to have somewhere warm and cosy to hide away. Made from bamboo and eco-fibres, it is environmentally friendly as well as being comfortable for your cat to snuggle up inside. 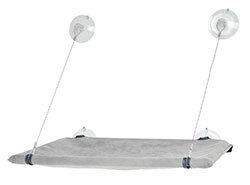 A removable soft, plush cushion fits perfectly inside the curves of the bed, and is easily removed for cleaning. The bed is designed to fit most radiators with a max. depth of approx. 10mm, and is easily assembled using velcro tabs, so you don’t even need any tools! If your cat’s second favourite activity after sleeping is sitting at the window watching the world go by, then this Karlie Flamingo Window Lounger is the perfect bed for them! The 4 suction cups attach the bed platform to the window allowing your cat to comfortably watch out the window from a higher position. 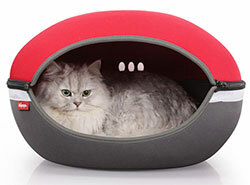 The grey soft cover is washable too, and the bed is designed to safely support the weight of cats up to 12kg. 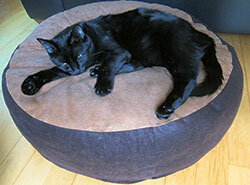 The Lazy Days Round Bed comes personally tested and recommended by PetMoneySaver’s very own chief product tester Inky! These beds are handmade to order, so can be fitted with a wide variety of covers to suit you and your cat’s tastes or even in a different size if you so desire. They are larger than the average cat bed, and the height of them makes them ideal for cats who like to sleep raised above the floor. After plenty of intense testing, Inky gives it the paws up! The Little Arena Pet Pod is a unique take on the pet pod style of beds. Made from a lightweight, yet sturdy EVA foam with a wipe-clean cover, it is strong enough to provide a snug and secure sleeping place for your cat. The wide entrance at the front gives your pet a good view of their surroundings, and there are 3 extra ventilation/observation holes at the rear. The top can be unzipped, so is easily removed if required for easy cleaning, transport or if your pet likes to sleep without a roof. It also comes with a comfy cushion. 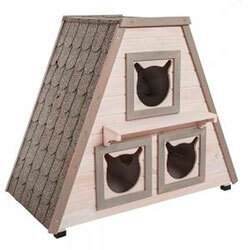 This Madeira Cat House is unusual in that it is designed for outdoor use. It has 3 separate sleeping areas on two floors, and is the perfect place for your pet to relax, and shelter from the wind, rain and cold. Each sleeping area has its own entrance, and the lower two dens are connected. The sturdy roof is covered in bitumen to make it weatherproof, and the flat platform on top of the roof is ideal for your pet to rest on and watch the world go by. 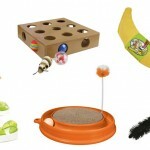 Does your cat dig funky and cool stuff? 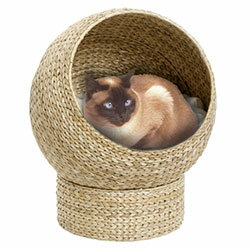 If so, this Retro Pet Nest is just for them! 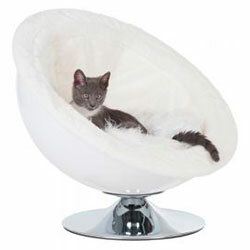 It is a 70’s style lounge chair, and is the ultimate in stylish cat beds. The white or grey acrylic shell on a chrome stand provides a large and comfortable sleeping area, as well as plenty of designer style. The bed comes with a comfortable cushion (fitted with four suction pads on the base, so it doesn’t slip on the smooth surface), and a soft, long-pile plush cover for even more comfort. It has a maximum load capacity of 25kg, so is ideal for even the largest cats. This Rosewood Cat Cave Bed is an ideal bed for cats, as they like to curl up in enclosed spaces, which helps them feel more secure and safe. 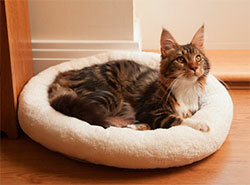 The bed is a decent size, suitable for all cats, and has a nice padded cushion inside. 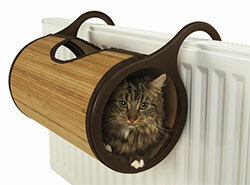 The base is non-slip, to prevent it sliding around when your cat jumps in and out. As well as being super comfy for your cat, how can you resist the cute looks with the little teddy bear ears on the top? The Round Doughnut Bed is a popular style of cat bed and there are a number of versions available to choose from, but this one from Tigga Towers is one of the best we’ve found. Since purchasing one a year ago, it has been well used by Inky who likes nothing more than to be cosseted by the soft outer ring as she sleeps. 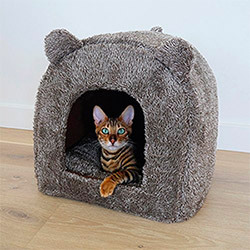 It is just the right size for a cat to curl up in, and is also designed to fit perfectly onto the very high quality cat trees that Tigga Towers are best known for. It is made from a very soft and luxurious fabric which is non-looped, so your cat doesn’t get their claws caught in it when they knead it in pleasure, before settling down for some serious cat-napping. 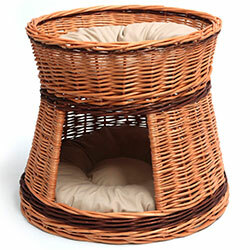 This rather lovely Wicker Two Tier Cat House Basket is hand crafted out of high quality European grown chemical-free wicker, and looks good enough to grace any room in your house. Your cat can choose from either the snug and secure lower tier, or the raised upper level which is the perfect location for them to rest and watch the world go by in comfort. 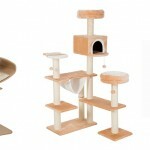 It comes with two thick and cosy pillows to provide a comfortable place for your cats to snuggle up on and rest. 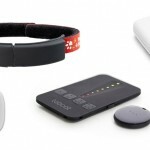 This entry was posted in Cat, Products on September 29, 2014 by Ed.